Rajah Tiger was rescued in January 2005 after he was found wandering with another tiger cub on a road outside of Charlotte, NC. Rajah and the other cub, Kaela, were finally picked up by animal control and taken to the North Carolina Zoo for a couple months then were brought to their forever home, Carolina Tiger Rescue. Rajah and Kaela point out a very important flaw in North Carolina laws. There are no state laws on owning non-native species, such as tigers. There are also no laws requiring those who own wild cats, such as tigers, to register their animals, so we do not know how many tigers are living in North Carolina. Rajah and Kaela came to live at Carolina Tiger Rescue at eight months old. As they grew, they became tour favorites and were affectionately called "The Cubs". Kaela was always the dominant one. She was the first to check out new enrichment and Rajah always stepped out of her way when she walked by. Kaela passed away in the fall of 2017. Rajah continues to be a fan favorite with his social nature and curious personality. He enjoys coming up to check out tour guests and will often follow them along the path as far as he can go. Rajah loves his pool in the summer and will frequently take his large boomer ball into the pool with him. He even likes to make the keepers' jobs more difficult by putting anything he can into his water dishes, including pumpkins in the fall! Elvis Serval came to call Carolina Tiger Rescue his forever home in April of 2009. Carolina Tiger Rescue got a call one Sunday morning from a woman saying she had a friend who had a pet serval. She said she could no longer care for him because of how aggressive he had become. When we asked for the woman's name and number so we could get back in touch with her about the cat, she hung up. At some point during the middle of that night, Elvis was dropped off outside our gate in a small dog crate with a note on top. The note stated that, though his family loved him very much, they could no longer care for him. The note also said he had been well cared for, given the best food possible, and given lots of room to roam. When we were able to have our vet look at Elvis, it was discovered that Elvis had been malnourished and likely spent most of his time in a dog crate. Within weeks of arriving at Carolina Tiger Rescue, Elvis settled into his new outdoor enclosure, one in which he could be the wild cat he is meant to be. He put on weight and muscle and despite being declawed, Elvis was able to catch and kill the black snakes that slithered into his enclosure. Elvis has certainly maintained the instincts of his wild cousins. Servals in the wild will often kill venomous snakes with their fast paw strike and can catch up to 4,000 rodents in a single year, making them predators not pets. Elvis is often a favorite stop on the tours at Carolina Tiger Rescue. Visitors can frequently see him lounging in the sun or patrolling his enclosure to ensure no one gets too close, though his favorite time of day is of course when the food truck starts up and heads his way! Saber Tiger was rescued along with 15 other animals from a roadside zoo in Colorado in the fall of 2016. Though he is white, Saber is not albino nor is he a "snow tiger". The white tiger gene is a mutation that only shows up in the Bengal subspecies of tigers. In the wild, only one out of every 10,000-15,000 births of Bengal tigers will produce a white tiger cub, and that cub will not survive due to its lack of camouflage. In captivity, white tigers are inbred, which causes lots of birth defects including blindness or deafness. Sometimes these tigers will have curved spines or seizures because they do not have good genes. Although they are beautiful, white tigers are not healthy and should not be bred. Saber was originally bred for a magician in Las Vegas. It is unknown as to why he was given up to the roadside zoo in Colorado. At some point when he was a cub, Saber was declawed and his canine teeth were filed down. This is often done to cubs who are handled to make them "safer". This is a painful procedure and one that can cause pain for the rest of the animal's life. Saber's teeth were filed down so far that the root was exposed, which can cause a lot of pain. In the summer of 2018, we were able to have a dentist group come in and do root canals on all four of his canine teeth. Saber is a social tiger who enjoys coming up to visit with tour groups. He is a great example of how beautiful but also how detrimental the inbreeding of white tigers can be. Saber is severely cross-eyed and it is unclear how well he sees. Though we are glad he is here, we hope one day white tigers will no longer be bred. Aria Tiger began her life as a pet in a family's backyard in South Carolina. Aria lived in their backyard for the first 10 years of her life, until she became very ill. When Aria was 10 years old, she began to lose weight unexpectedly. Her family was feeding her, but she continued to lose weight. Her family tried their best to find a veterinarian who would be willing to take a look at her, but none would. It is extremely hard to find a vet who will not only be willing to look at a tiger, but also who knows how to help them. As Aria became sicker, the neighbors next to the family became extremely worried about her and called the authorities. 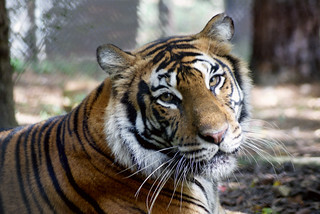 Carolina Tiger Rescue was called to bring Aria to North Carolina. We were worried she was not strong enough to make the trip, but she surprised everyone. When our vet was able to get bloodwork on her and do a physical, it was discovered that Aria had EPI (Exocrine Pancreatic Insufficiency). Her pancreas was not producing the enzymes needed to digest her food. So even though she was eating, she could not properly break down the food to absorb it, so she was starving to death. With her meals, from that point on, she was fed beef pancreas, which broke down the food for her so that she could absorb the nutrients. Aria quickly put on weight with her new diet and her personality began shine. Though she passed away in 2016, Aria's story continues to be an important one. Even though her family loved her very much, they could not provide her with the proper care a tiger needs. Aria never should have been a pet. Lola Kinkajou's start to life is somewhat of a mystery. Carolina Tiger Rescue got a call about Lola in the summer of 2013 after a kinkajou was found in a woman's backyard in High Point, NC. The woman called animal control after she found the lethargic (sluggish) animal in her vegetable garden one morning. When animal control responded, the officer actually knew what kind of animal she was, trapped her in a trashcan, and called Carolina Tiger Rescue. It is unknown how Lola got to the woman's backyard and whether or not she was a pet who had escaped or was let go. Lola is a feisty kinkajou who is quick to show you how aggressive she can be. Kinkajous are, unfortunately, popular in the pet trade, however, many times owners find them to be extremely aggressive and give them up when they become hostile. Kinkajous are native to Central and South America where there are lots of larger predators that will try to make a meal out of them. They have to be quick and aggressive to defend themselves and they do a great job of it. Sheba Lion came to Carolina Tiger Rescue in 2010 with nine other big cats from a failing rescue, Wild Animal Orphanage, in Texas. The facility in Texas was home to over 300 wild animals and the facility ran out of money to care for them. Carolina Tiger Rescue worked with IFAW (International Fund for Animal Welfare) to rehome the animals, bringing 10 of them to North Carolina. Of these 10 animals, seven were tigers and three were lions. Sheba began her life as a "Pay to Play" or "Pay to Pet" cub who was walked up and down the beaches of Cancun on a leash for tourists to take pictures with her. By the time she was six months old, Sheba became too aggressive and too much to handle. She was rescued and sent to the Wild Animal Orphanage in Texas. There she was eventually placed with two neutered male lions, Sebastian and Tarzan, and all three came to call Carolina Tiger Rescue home in 2010. The trio could often be found lounging together in the sun, sleeping the day away. As the only social cat, lions prefer the company of their kind. In the wild, lion prides can have as many as 40 members. Sheba has always been in charge of this pride; she always eats first when they are sharing a large meal and is always the first to destroy any enrichment they are given. This is not a common occurrence in wild prides. In the wild, male lions eat first and are the dominant ones in the pride. Sheba loves to know what is going on around the sanctuary. She is always on alert, ensuring she is ready to defend her enclosure from encroaching vultures, and is always the first to know when the food truck is coming. Sheba is not shy to try new things and is extremely food-motivated. Though she is small in stature, she is mighty and has a larger-than-life personality and an attitude to match. Despite having a rough start to life, Sheba now lives her days sleeping and eating with no worries in the world.